I really like this fan. It was straightforward to install but took a little bit of time. The crystals were already assembled to the shades. We put LED lightbulbs in because it will be difficult to replace lightbulbs. The fan blades match my gray brick fireplace very nicely. 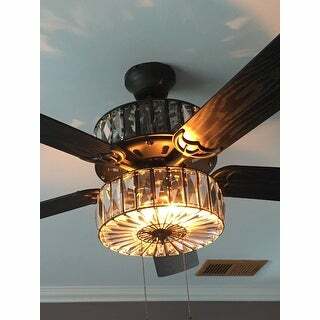 Illuminate any room in style with this crystal ceiling fan. Six lights highlight the 78 caged crystals on both the upper and lower components for the ultimate in shine and design. Five wood grain textured blades allow for maximum air movement and are reversible. A traditional mahogany finish adorns one side of each blade, while the opposite side features a sleek, modern grey/black color. Pull chain switches allow for manual power off/on, light, and three-speed reversible motor. Includes remote control for ease and convenience, featuring buttons for blade speed and light operation. A short 4-inch down rod and longer 21-inch down rod are included for two display options, as well as flush mount. This item must be hardwired and installed by a qualified electrician. 78 caged crystals encircle fan. Dimensions 52.0 In. X 52.0 In. X 1835.0 In. So in love with this fan!!! Not like most. I almost didn't purchased this one due to the comments about the difficulty of changing out the top bulbs. There was a comment about having to take fan down to do so. 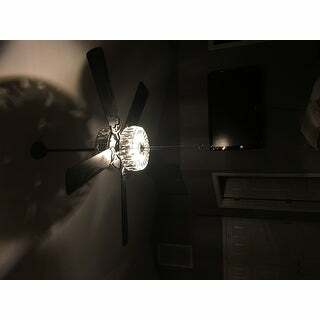 I have mine mounted with the smaller rod(room has 8/9ft ceiling) and there is enough room to work with, without having to take the fan down to change the light bulb. Only know this because at first I didn't have the light bulbs screwed in tight enough so top portions wasn't coming on. I easily was able to just unscrew the top cage (while fan still being mounted) and tighten. Maybe if you flush mount it, you could have difficulty then (idk). Also, I found some led bulbs on amazon.com that were soft glow (cause I don't like the white light color most LEDs give off). The top takes the special nite lite type bulb and hard finding different color ranges in the regular stores for those (I'm picky with my lighting and prefer warm lighting). I like that you have multiple settings for the light kit (off, top on, bottom on, top and bottom on). One negative was that I did get a bad remote and/or receiver. Had it installed by a professional electrician, it worked at first but by the time he was about to leave and I tried the remote myself it had stopped working. Luckily he was still there, to uninstall the receiver on the fan so that I could still use the fan/lights manually. Without doing so the fan and lights only worked in one position because the remote controls the different speed/lighting options. I was going to go back to Overstock for new parts but at this point it would be more trouble reinstalling, so I will just manually change the fan speed and lighting options manually. I'm short but can reach the pull chains just barely on my tippy toes. 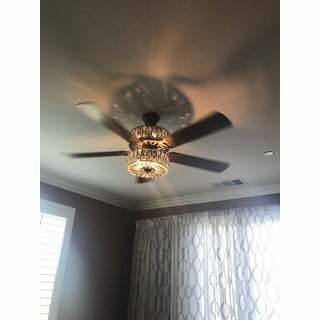 This fan is absolutely gorgeous and really put a nice flair in our Master Bedroom. It came assembled (no string on crystal pieces) and was relatively easy to install. Just be aware that the lights on the top of the fan are a real pain to change. 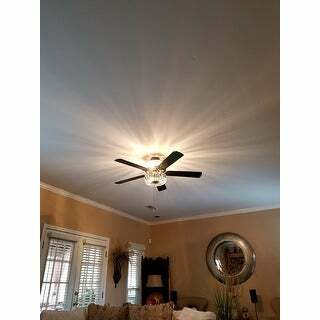 Be sure and add the bulbs BEFORE you hang the fan. Also, finding the correct bulbs was a bit of a challenge. We ended up using "nighlight" bulbs and I am glad we did. When you have the top part of the light on now, it gives off a warm glow. 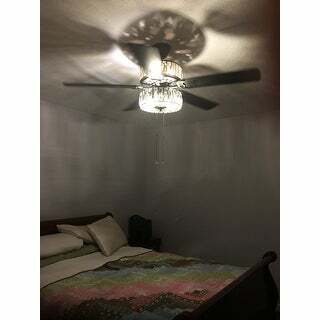 We put LEDs in the bottom of the fan and it really lights up the bedroom very well. No need for additional lighting. The lights are not dimmable, so if you want that feature you might want to look at another fan. Also, we thought about putting a medallion up before installing the fan but decided against it. I am glad we did not put a medallion up. The top light of the fan projects this beautiful pattern and I think a medallion would have clashed with it. The fan is very quiet and we did not have any issues with having to balance the blades. We are blessed with the quality and will most likely order other fans by this brand. Hope this helps. It is well worth the money. If you are going to redo a room, why spend all the money and time on paint and flooring and then just throw up a "home improvement" center fan. We looked at all the local places and did not find a fan with this style ! Absolutely beautiful matched my master bath vanity lights and my kitchen peninsula pendants...finding crystal bronze light fixtures was such a challenge but I’m happy I found this gem. I agree with previous reviews the lights in the fixture where the 4 night light bulbs go I have no idea how I will change those once the time comes but oh well at least the second fixture is accessible. It is a pretty large fan...the only thing I wish was that the black side of the blades were solid black instead of those gold foil wood looking prints...I actually painted the blades solid black myself to go with all my other decor. I recommend ge hd reveal led bulbs. Beautiful fan, I love it! 4 star because of the access to the top cage and having to paint my blades solid black. The crystals glass pieces are nice. The bulbs for the top are difficult to find. The installation takes time and should be by someone who has some experience installing it. Looks like the picture. The blades come in both brown and black, and can be reversed. Beautiful fan, yes maybe a little crooked but may not be the cause with more cautious installation. The bulbs are hard to find and replace. I wish they would include bulbs with the purchase. IT looks elegant and the lighting definitely give an eclectic feel to the room. The lighting is not enough for reading. we finally found the bulbs in home depot and put them through the trap door on top fo the fan. It is best to get the bulbs before installation: PLCC7LED C7 7W and B11 40WFILE12 This fan motor has started making a humming noise. Fan visual, fine. Lighting, horrible, very dim. Would never be suitable for living room. I am very particular when I install fans (I do this for a living so yes, I am the professional installing it) to the point that I measure everything, use a level, check degrees of fan blades to make sure one is not slanting more than another. 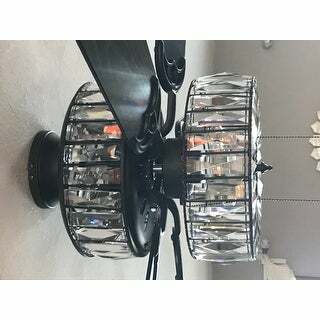 Although this fan is rock solid and does not wobble, the crystals in the bottom lighting fixture area make a tink, tink, tink noise constantly nearly driving me insane! It is better when the fan is on high but it sounds like a wind tunnel when on high. On medium or low the tinking noise from the crystals clanking against the metal is just too much for me. If the manufacturer had used two bolts to mount the bottom light fixture rather than using a single finial to hold it on I feel this would resolve that constant tinking of the glass. Even though my fan is rock solid and visually you cannot see any wobbling, at all, the motion is just enough to make that single finial attachment move just enough for the glass to tap against the metal. I am going to remove bottom light fixture and hot glue all the crystals in place and hopefully that will resolve that constant tinking noise. UPDATE: The lack of lighting and that constant annoying tink, tink, tink of the crystals against the metal made me resign to sending the fan back. The idea of taking the bottom portion down to hot glue the crystals still would not resolve the lighting challenge so it had to go back. Very pretty but a little noisy. Changing light bulb on top of fan will be a little difficult & it takes 4 on top. Comes with remote but you have to connect adapter to or you can just use wall switch. 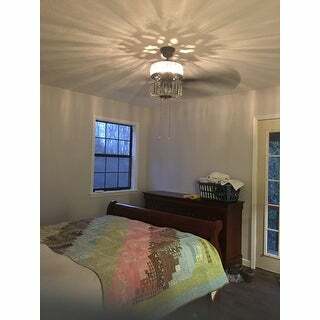 Beautiful fan with remote put in master bedroom you can choose both lights or top and bottom. I use brighter lights on the bottom. Need's to man power to install safely. 3 speeds on fan and remote. Must keep your light switch up on the wall to use the remote. Wanted to attach photos of fan installed. Its beautiful. 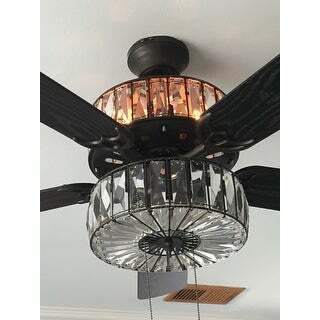 This fan is gorgeous! I gave it 4 stars because the lights will be hard to replace. I recommend using LED lights because they last longer. You have to take the fan apart to replace the top cage lights. I ordered the LED lights from Amazon. Hired someone to install took about an hour. The fan is gorgeous. The crystals reflect light both top and bottom. You can adjust the light settings. The remote control is an added bounce. Honestly there isn't anything about this fan I don't love. Beautiful fan, super quiet and works great. Love having the clicker. 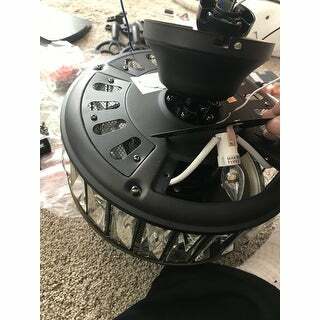 The only reason I gave 4 stars instead of 5 is because this fan was really complicated to put together, and directions were poor as well. Other than that completely happy with my purchase! This fan is lovely but because of the way the glass is cut, the light isn't just a direct light. It throws off "prisms of light" that looks kind of diamond cut against the wall, kind of like in an aquarium. Because of this the light is also dimmer. The effect is nice for about 5 minutes and then you just want a strong, direct light. I bought this fan for a guest bedroom than isn't used a lot so I'll keep it, but I wouldn't want this light in my own bedroom for daily use. Absolutely love our fan... Adds such charm to our bedroom and works beautifully!!! Best purchase! 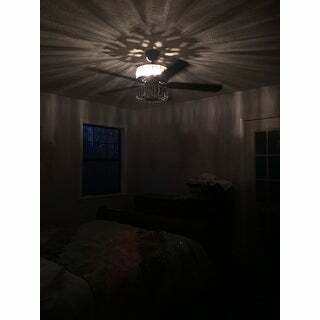 Love it makes my master bedroom look stunning sting fan as well has a nice feature to the light the top part or the bottom part or both. Love it just wish it came with a 4 foot pole and wire. Sparkly and elegant, but quite dim lighting. Not too easy to get to the bulbs for replacing, but overall a nice upgrade to our master bedroom. Fan works fine. Very beautiful fan. Good quality, good design. It has a remote so very convenient to use. I am very happy with this purchase for my bedroom. Looks great! 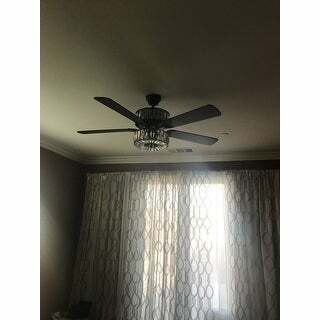 Purchased fan for master bed room. It looks pretty and am satisfied with the look but does not give out a lot of light, especially the top part. It works for us as we already have can lights in the ceiling. Installer mentioned if would have been better if there had been two bolts instead of one on bottom of fixture. 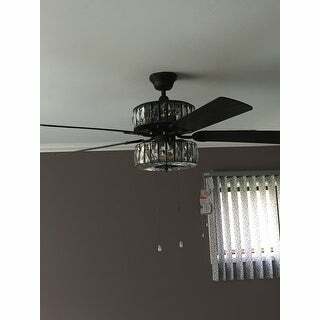 Beautiful ceiling fan for our master bedroom and Overstock had the best price on this. Make sure to buy the right sized light bulbs to avoid the fan rubbing against them and creating the clicking noise that a lot of reviewers complained about. With the right sized bulbs, there is no noise when it's turned on. 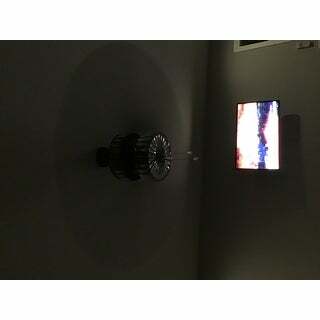 "Is this fan bright enough to use in a living room if LED lights are used?" That really depends on the size of the living room, and how bright of LED bulbs you purchase and use. If you are using bright white bulbs, it should be fine. I would say no. The bulbs are so small, they're the same bulbs you use in the old fashioned strands of Christmas lights. They're hard to find. If you like a bright room, I would get something else. "Is there a remote available for this fan?" A remote comes in the package. "What is the energy cost and selectric consumption/use?" "Are both sets of lights always on or can you turn on top or bottom or both?" The pull chain is used to control the lights; yes, you can turn on the top, bottom, or both. "We just installed this yesterday and the noise is insane. Did anybody else have this problem and find a solution?" We've installed 2 of these now... first one went into my mother-in-law's living room and I loved it so much I purchased it for my bedroom. No noise with either of them. If you use the wrong light bulbs in the top section - like "normal" candelabra bulbs they might be a little too fat and the fan rubs them and creates a grating noise. Make sure your bulbs don't rub by using the correct one in the directions (although they are a little hard to find). Alternatively, hand bend the light sockets in the top section just a bit outward so they do not rub. "Can we install fan and only use the base with crystals and leave the bottom crystal piece off?" 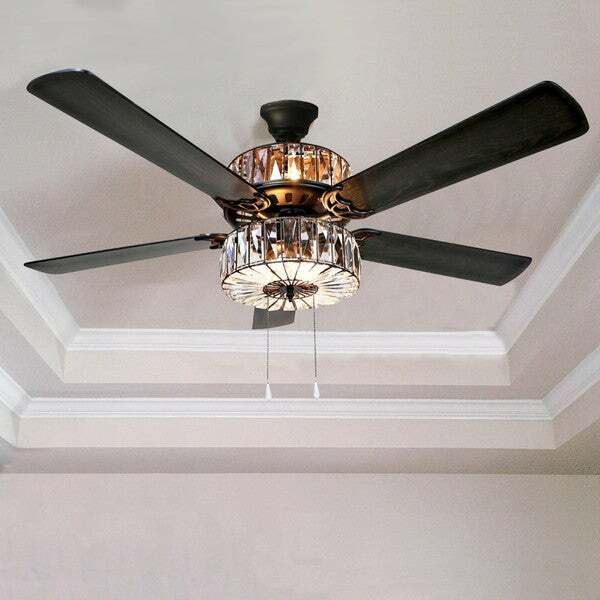 The fan is designed to only be used with both the upper and bottom shades installed. "What is the airflow of this fan?" The blades were smaller than I expected. The air flow is reasonable.